Keep an eye on all legal cases with real time access to critical data and instant updates 24/7. Without installing any software on User PCs, Laptops or Mobiles, eLCMS helps you plan, initiate, assign and review all legal proceedings in courts by performing simple steps. It uses latest web technologies to provide a trouble free and easy to use user interface supported by strong and scalable backend and database. eLCMS is completely secured via encrypted transfer of data and deployed at your bank’s data center. Only authorized users can access the system using valid user ID and Password. Everything is managed in real time and available for users as per their pre-assigned roles and rights. 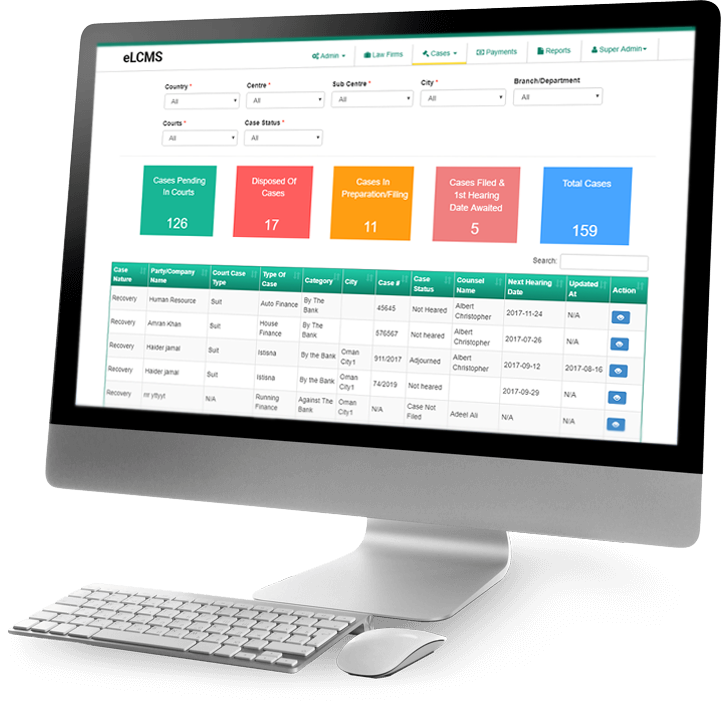 eLCMS is built with capability to track all types of Recovery, Property and HR related cases. For all Non Performing Loans (NPLs) it interacts directly with Core Banking System. It populates NPL data and keeps it updated on daily basis giving complete visibility about status of defaults and helps you create checklist of required documents and prepare a case for filing in court. Once a checklist is approved with relevant documents along with recommended external counsels an authorized user can initiate a case in eLCMS by entering first hearing date or court case number in the system. A detailed daily diary of the case is available to record date wise updates on the case up to the final verdict. System lets users change court or counsel anytime in any particular case. eLCMS stores unlimited law firms and their external counsels who work on bank’s panel. System also tracks all payments made to counsels against each case. Counsels are notified for up-coming hearings via email and SMS notifications. Reports are available to see counsel performance in terms of case outcomes. Counsels if allowed can also directly update case progress on case diary section. Key pre-built reports are part of eLCMS and are available to users with rights to view reports. These reports also include specific formats required as per guidelines from central bank and other regulators. Reports are shared via email notifications or can be viewed in the system based on different filters and date ranges and can be exported in Excel format. 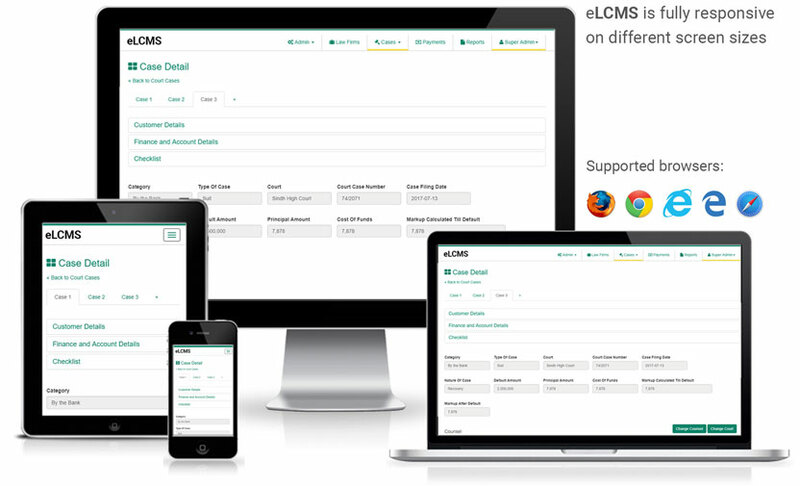 The eLCMS is developed by a team with over 35 years of combine development experience in building web based software for large to medium size enterprises in USA, UK and Pakistan. While the system is designed to be fully self-service, a dedicated team of developers and support professionals supports all pre and post sales functions including requirement gathering, customizations, documentation, development, testing, deployment and onsite and offsite trainings.